The Women 7 (W7) is a forum aimed at fostering dialogue among civil society, business, academia, and the G7 institutional representatives on issues related to gender equality and to the woman’s role as an agent for change, inclusive growth and sustainable development. 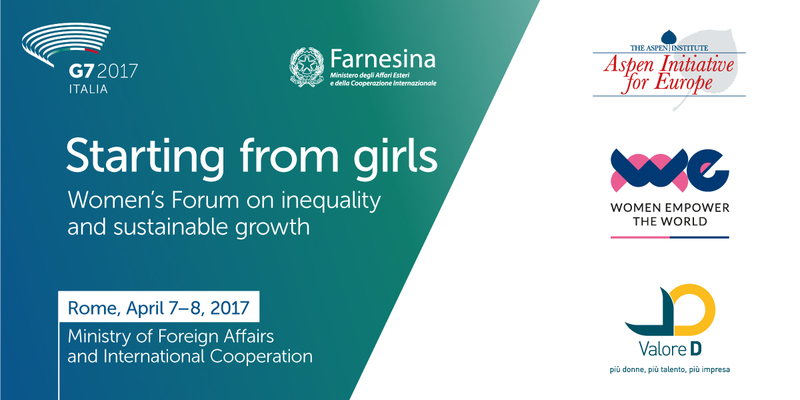 Gender equality is a key priority area in the Italian G7 Presidency Agenda. Consequently, Italy has decided to continue the Women’s Dialogue, first created by Chancellor Angela Merkel in 2015 to debate issues related to women’s economic empowerment. Over the next two days (April 7-8), the W7 aims to formulate policy recommendations to convey to the Heads of State and of Government meeting in Taormina at the end of May. More than 100 people – mostly but non exclusively women – from all over the world will gather at the Ministry of Foreign Affairs and International Cooperation to analyze the issue at hand. They intend to propose shared and viable solutions to increasing women’s participation and to promoting equal opportunities for leadership at all levels of decision-making; to strengthening the foundations of women’s access to decent and quality jobs; to removing barriers to the full development of women’s and girls’ potential and talents; to eliminating gender stereotypes and discriminations, including at the workplace; to sharing more equally the unpaid care and domestic work; to granting equitable access to health, and to protecting migrant and refugee women and girls and to facilitating their integration in destination countries. On Saturday morning, a special session will be devoted to eradicating gender-based violence. Undersecretary of State Maria Elena Boschi is expected to participate. The Prime Minister, Paolo Gentiloni, will greet all the event’s participants during the dinner to take place at the French Embassy, in the beautiful Palazzo Farnese, on Friday evening. It is worth mentioning that the technical experts of the G7 Working Group on Gender Equality and Women’s Empowerment will participate in this event. They will also gather on Saturday afternoon to discuss the “G7 Roadmap for a Gender-Responsive Economic Environment”. The Roadmap will then become an annex of the Leaders’ Declaration, to be adopted at the Summit in Taormina. The W7 is organized by the Aspen Initiative for Europe, WE-Women Empower the World and “Valore D”.